opening out from a fine disc are soft, curvy spirals that fall gently downwards. Depending on how low you hang the lamp, the the silhouette of Pirce can be more flat or longer. The bulb sits in the bottom, shell-shaped dish and emits the light upwards. The pendant lamp by Artemide creates an indirect glow and makes impressive light and shadow effects. The Pirce, made of lacquered aluminium, of course looks good in the living or dining room, though it also gives a special touch to offices (IP 20). The clear, defined design, typical for Scutellà, has been awarded on numerous occasions. The fascinatingly designed lighting series by Artemide has received the red dot award, iF Design Award and the American Good Design Award.Artemide offers a complete series of the precisely designed light: the Pirce is available, for example, as a ceiling lamp, wall lamp or in a smaller version. 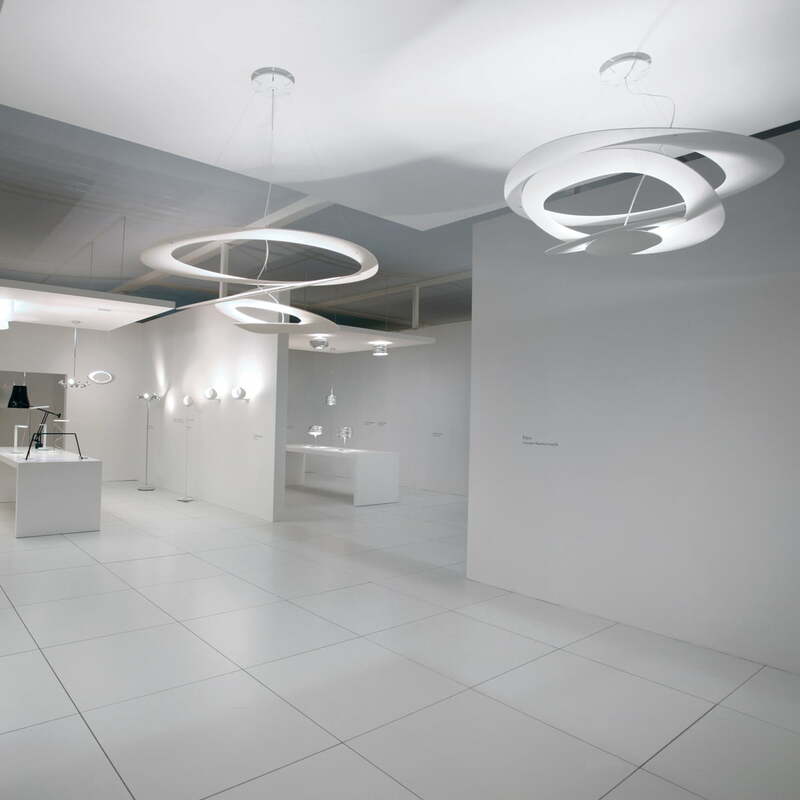 Single image of the pendant lamp Pirce Sospensione Halo by Artemide in white. 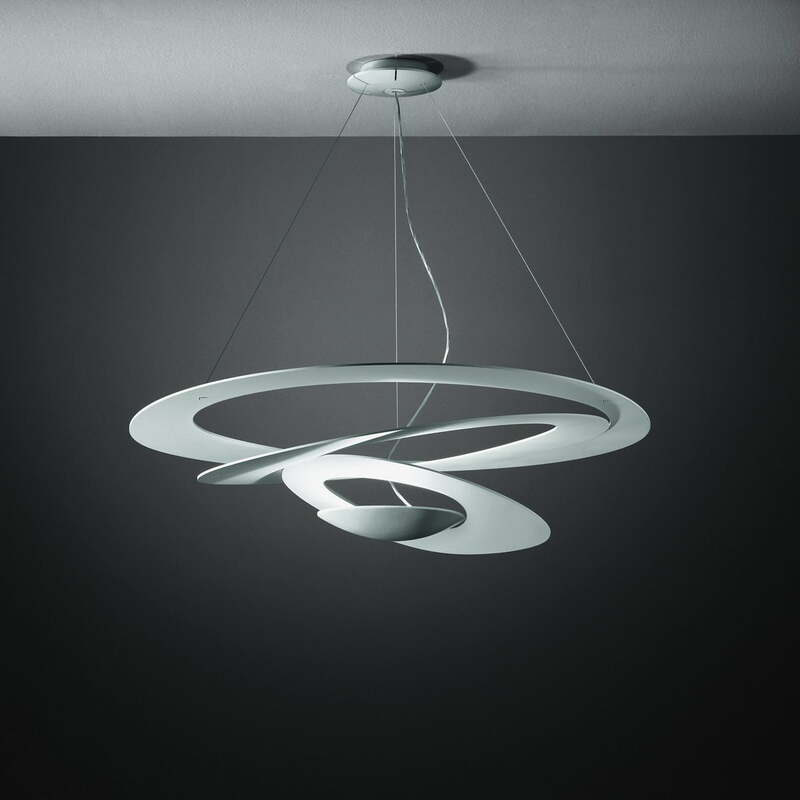 The design was created by the Italian Pirce Sospensione Halo and already won several awards. The pendant lamp Pirce Sospensione Halo by Artemide is installed at the ceiling. The graceful lamp can be mounted individually in varied lengths and positions. As a Group in a long hallway, the pendant lamp Pirce sets a special scene and provides for particularly individual light. 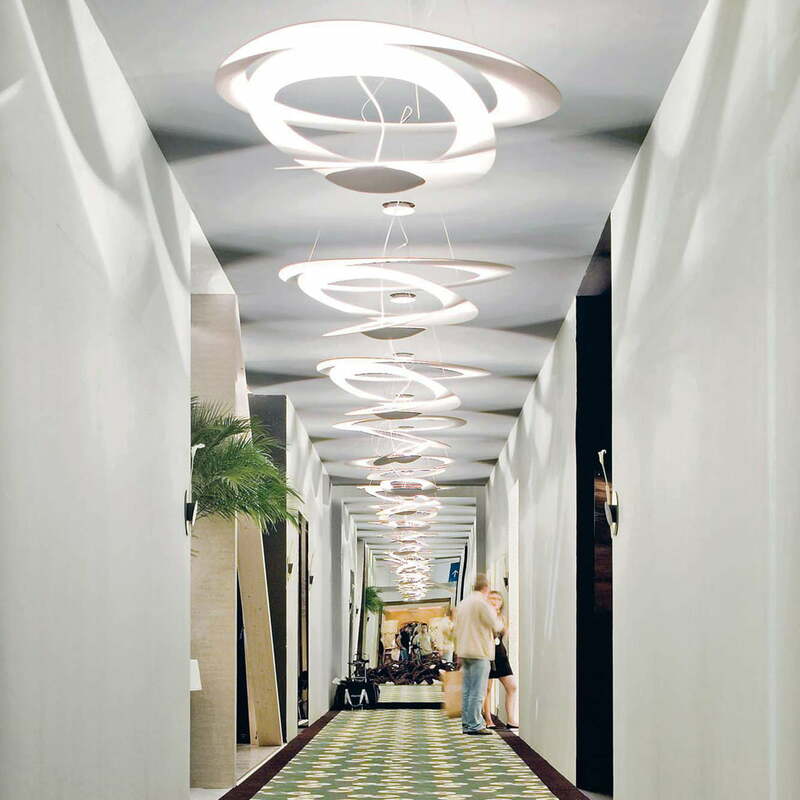 The Pirce Sospensione Halo by Artemide is suitable for hallways in hotels or public areas. Thanks to its clever mounting, the Pirce Sospensione Halo Pendelleuchte by Artemide can be varied in its height. The white lamps match light rooms and provide for a unique atmosphere.